This strong, Military Grade, tan, plastic, buckle set or clip set, is meant to be a replacement set for the United States Military backpacks. They are easily useable with most types of webbing and can be used as replacement buckles and clips or as original manufacturing parts. Each buckle or clip is a set that consists of a male and a female part. We have about 20 to 30 thousand buckle sets, once they are gone, they’re gone. Please do not hesitate to ask for bulk pricing. The side release buckles have a patented open attachment point for the nylon webbing so that you do not have to cut the stitches on your nylon webbing loops to get the buckles on and then resew the webbing. No sewing is required to replace these backpack fasteners, making field repair a snap! Requires no tools to install. 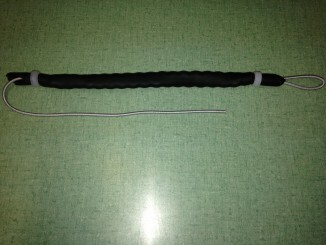 Simply cut the old buckles off by cutting the plastic buckle not the webbing, and put the new buckle on. These buckles are a permanent fix and will not fall off. The adjustment buckles or ladderlocks also have this technology. Made in The USA. 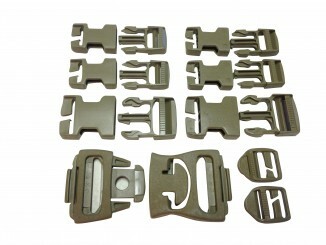 1 each, 1.75″ center release main buckle set. 2 each, 1.5″ side release buckle set. 4 each, 1″ side release buckle set. 2 each, adjustment buckle or ladderlock. For a total of 7 complete buckle sets and 2 adjustment buckles or ladderlocks.